Der Spiegel continues to be the window into the complex world of EADS and its giant subsidiary Airbus. 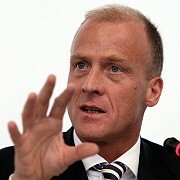 In a major interview with Airbus CEO Thomas Enders, Der Spiegel throws light on the corporate challenges facing the organization and its leadership. Technological innovation is notoriously risky, and there must surely be additional risk factors emerging as a consequence of the financial turbulence of the last year. The A400M is becoming known as its albatross. The plane, still yet to fly, is a military transport plane promising payload deliveries over extended distances under extreme conditions. Delays and production mishaps have plagued the project (even in comparison with the more publicised woes of the company’s other high-technology efforts). Der Speigel runs excellent and probing articles. One can’t help admire its success in its interviews with Germany’s business leaders. [In style it reminds me of the aggressiveness of England’s Newsnight programme and its chief Rotweiler Jeremy Paxman]. In the issue carrying the Thomas Enders interview, there were similarly tough questions asked of Robin Goudsblom, a Lidl senior manager, over the company’s personnel scandal;and of Nikolaus von Bomhard, CEO of reinsurance giant Munich Re, over banker bonuses. Under fire, Thomas Enders is remarkably direct. He was first reminded of a recent wager. SPIEGEL: Mr. Enders, on December 31 you won a bottle of champagne. You had wagered that Airbus would manage to complete 12 of your super-jumbo jets by the end of the year. That bottle could cost your company millions because, in the heat of the race against the clock, quality and safety may have fallen by the wayside. Then he faced equally direct questioning on a range of general topics such as Government subsidies. These did not result in subsequent wider headlines, perhaps because they were ‘nothing new’ either in question or reply. SPIEGEL: Your biggest worry is currently the planned A400M military transport aircraft, which has been in the news for months. Which countries could cancel as buyers in the future? Enders: EADS should never have signed this contract. Our American competitors would never have accepted such conditions. We’ve made big mistakes, and errors have also been made on the customer side. We should now rectify these together. Enders went on to deal frankly with equally tough questions on ‘[r]ivalries and power struggles between the Germans and the French’, consolidation of the European headquarters in Toulouse [‘maybe a good idea’], and the loss of a major American military contract. I was struck by the tone of the interview and by the fascinating technical insights provided into corporate and production management. How important is the interview to EADS? This is one of the questions open to reflection and debate. I suggest that Der Spiegel is a media leader in news of the Airbus adventures from a European perspective. Its interviews are guaranteed widespread subsequent coverage. A typical example is the report in Aerospace [30 March 2009]. Even The Economist draws on the Spiegel interview, although its piece shows evidence of its own deeper research [bonus points to the Economist for that]. The interview has to be taken seriously by the company leadership. A faulty performance (and it is a performance) would become part of a subsequent narrative developed in the media. How well did Enders do? You could assess the interview for strengths and weaknesses. A misguided remark might become a hostage to fortune for the company in the future. On the other hand, the impact is mediated by several communities deeply concerned with the future of the company and whose judgments go to make up the ’conventional wisdom of the dominant elite’ . Enders has the responsibility to defend his position without being too defensive, and avoid easy-to-refute claims. Which in this case involved a painful level of openness. If he appeared a bit testy at times, that might be a permissible weakness rather than a fatal one. Despite tough times, the corporate leadership of EADS seems to have stabilized under the urbane Louis Gallois, and his Airbus CEO, the former paratrooper Thomas Ender. We have followed this story in earlier posts. The Economist article on Airbus can be found in its April 11th -17th, 2009 issue. You are currently browsing the archives for the Tom Enders category.